Why Stay at the English Bay Inn? The English Bay Inn is located in the West of Denman area, a small, primarily residential area in the West End of Vancouver. West of Denman is comprised of the 3 blocks between Denman Street & Stanley Park and the 9 blocks between English Bay & Coal Harbour. Our location means just a short walk to English Bay, The Sea Wall, Stanley Park and Coal Harbour, all top favorites for visitors to Vancouver! 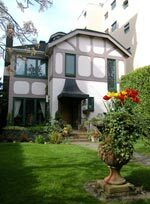 We are also just a short walk to Denman Street for restaurants and shops, as well as to Davie Street and Robson Street for shopping and restaurants. The ferries to Granville Island, Vanier Park and to Yaletown are about a 15 minute walk down the Sea Wall. Our General Manager, Alberto, is an engaging host that loves to cook and takes great pride in ensuring that his guests have a happy and memorable stay while visiting Vancouver. He always looks forward to meeting new people and to seeing those returning to us for another stay. Blending its past heritage with contemporary modern conveniences, The English Bay Inn has been recently refurbished with care and a great deal of thought for the comfort of our guests. We offer 6 Rooms in total, 5 of which are in the adult only b&b section of the Inn and 1 which has been revamped to accommodate those travelling with children or with more than two guests. Click here to see information and pictures on each of our rooms. Fill your stomach without emptying your wallet! If you have booked a stay in Rooms 1, 2, 3, 4 or 5, your stay includes breakfast service for up to 2 adult guests on each morning of your stay. After a restful nights sleep, head to our elegant formal Dining Room to start your day with a delicious and filling breakfast. Seat yourself at the dining table, or inquire about reserving the table for 2 in the Dining Alcove. Begin with coffee, tea or juice, followed by a delicious seasonal fresh fruit plate and finish up with a hot entrée which varies daily.